“Will that be cash or credit?” That seems to be the one question that you hear frequently at the cash register of your favorite traditional stores. Even on the Internet, when your customers have chosen the products that they want, they will be required to select their preferred payment method shortly thereafter. 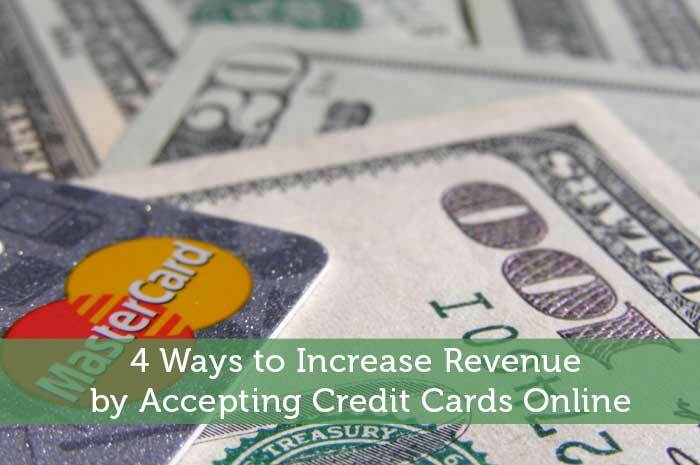 Even though many consumers might prefer to use cash or even electronic checks, there are four key ways that you can increase your bottom line profits by accepting credit card payments online. There are 610 million credit cards being used collectively by 181 million people within the United States alone, according to The Credit Examiner. By accepting credit card payments online, you will be catering to the needs and interests of the masses. If you operate a traditional, brick-and-mortar business, you will be able to increase the efficiency of your order fulfillment process in general. On the other hand, within the world of eCommerce businesses, accepting credit cards is basically a requirement if you want to succeed. Another way that you can increase your revenue and bottom line profits through accepting credit card payments online is to eliminate processing fees that are usually generated by chargebacks. Take, for example, the fees and expenses associated with accepting checks. Whether they are paper or electronic, you run the risk of having that check bounce. By the time you find out about this occurrence, in most cases, the product has already been shipped and delivered to the customer. Now, you are required to use your time, money and resources to collect the original purchase price in addition to the fees associated with that returned check. By offering the secured processing of credit cards, you will also keep your customers protected from identity theft and security breaches, according to TransFirst.com. It is important for you to keep in mind that cash payments have evolved from dominating forces within the world of commerce into endangered species. With the increased desire for customers to have more convenient options made available to them, it seems as if cash payments are no longer as popular or prevalent as they were in the past. The same report compiled by The Credit Examiner also showed that point-of-sale purchases paid in cash will drop 4 percent to 23 percent, while credit card transactions will increase to 33 percent within the same timeline. Therefore, if you want to make sure that your sales and bottom line profits do not become endangered species as well, it would be in your best bet to prepare now. Another way to generate more sales would be to offer promotional discounts and online coupons for customers that use credit and debit cards to complete their purchases. It is true that using a credit card is the most convention payment method, especially if you have an eCommerce method. Therefore, this particular method may not make very much sense to you at first – especially if the vast majority of your sales are already paid for through these plastic cards. However, you need to change your perspective to focus more on the fact that you will be able to increase your conversion rate and generate more sales in general by offering promotional discounts and incentives. This method has more to do with driving more traffic towards your checkout stage in general. Accepting card payments online will increase your efficiency, conversion rate, generated sales and overall revenue. Within the world of business today, the goal is always to stay relevant and competitive – especially in a tough market. Accepting these payments will allow you to do just that. Credit finance: Credit cards interest rates are high especially for those whom they foresee as bad risk. It’s just the same if you apply for a business loan or a personal loan. If banks doubt your capacity to pay, they will charge higher interest if ever your loans get approved.